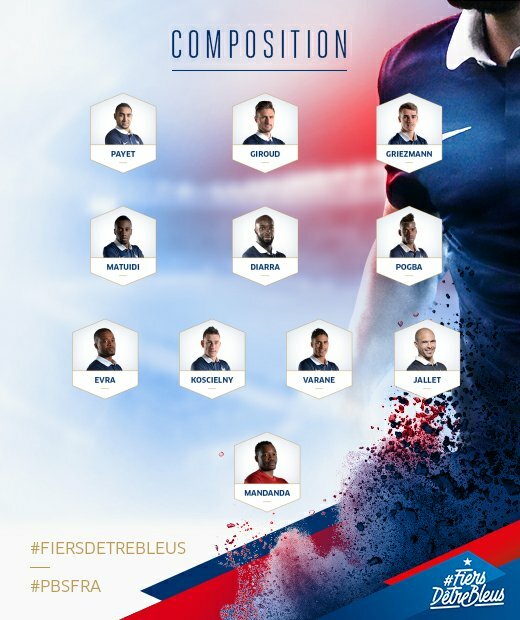 Home › Analysis › Netherlands vs France 2-3 Players Ratings . 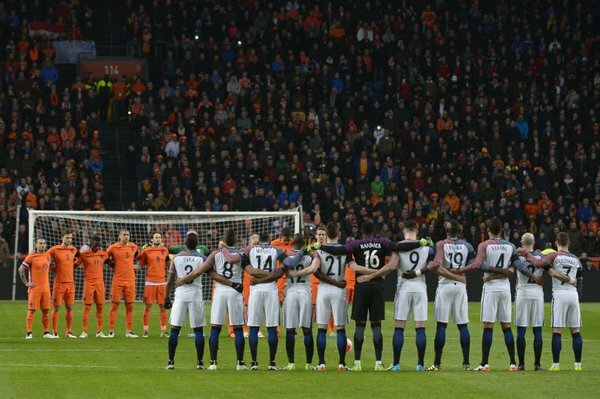 EURO 2016 hosts France, kicked off their preparations, winning 3-2 away in Holland on a night who will be remembered by both teams and a whole country as the emotional tribute to the late great Dutch player, Yohan Cruyff. 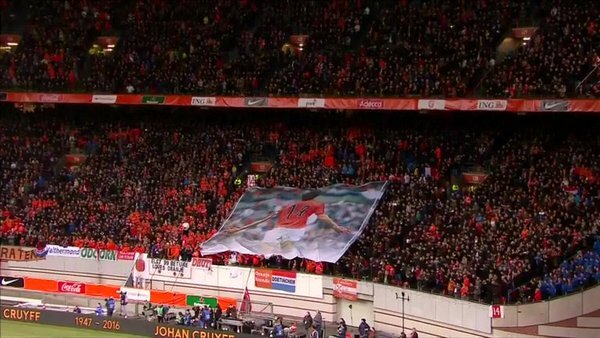 Netherlands found themselves two down, before the planned applause on 14 minutes for the legendary number fourteen player( Antoine Griezmann 6th and Olivier Giroud 13th). Memphis Depay curling delivery found Luuk de Jong(47th)who scored, although replay showed that it was handball; after the break Ibrahim Afellay put Holland on level(86th) but PSG’s Blaise Mathuidi, captain for this game and wearing the number 14 jersey tuck home a late winner. Not at ease near the ball; should do better for the first goal and he may be disappointed letting Mathuidi’s winner pass past him.Made two smart saves during the first half(Payet). Had little impact on the game and straggled defensively; his only contribution was a whipped cross, the rest…. Had a lot to do with Martial’s and Payet’s pressing and was lucky not to concede a penalty vs Mathuidi.He made some good defensive clearances though. He wasn’t at ease dealing with Griezmann during the first half; he was much better after the subbing of the Atletico player and was one of the rare Dutch players able to defend. He couldn’t deal with the strength of the french midfield;Mathuidi and Pogba were a handful and he was subbed by Depay at the break. Played some good balls but failed to score from a long range set-piece: left the pitch after 35 minutes due to injury. A threat for Mandanda but alas he lacked precision to finish; not in a good day? Good relationship with Promes and held the ball quite well; scored just after the interval but replay showed that he should be ruled out for handball. Holland’s biggest threat, no doubt; he ran at the France defence , produced a couple of good moves and showed some good dispositions. In to replace the Bleus and Tottenham captain Hugo Lloris (rested), he was rarely called into action; he dealt well with Promes speculative drive from distance but couldn’t do much to stop Afellay’s goal. Nevertheless he should be more commanding for the Jong’s one. A constant threat ; playing on France’s right flank got into a number of dangerous situations for the Dutch team. He may have been beaten once or twice from Promes but played a part in France’s second goal. Good crossing. He made a couple of good clearances and was commanding in defense. A bit uneasy dealing with Promes’ speed and failed to stay close to Jong allowing him to test Mandanda on close range. A quiet evening for the Juventus man.He had little to do defensively before getting subbed at half time. He helped France’s defense by making several well-timed interventions but there was no real danger as the Dutchmen weren’t a 100% in the game. Got subbed at half-time by N’Golo Kanté. The Juventus jewel brought the ball out from the back with ease and helped bridge the gap between the defence and the attack. He asserted himself well and made a good impact in the game with Matuidi. He scored an early goal on a set piece and never stopped harassing the Dutch defense.Replaced by Martial at the break. The West Ham player of the year(?) was given a chance to shine for his country national team by Deschamps and he didn’t let it pass. After a poor beginning he showed his good form and made a good impact by running at the defense, linking well with his teammates and winning the corner who led France’s second goal. The Arsenal’s man knew that he had to outdo himself in the absence of Karim Benzema, France’s number 1 choice.Held the ball well and linked France’s attack correctly. Scored a well-done goal. Captaining the side in the abscence of Hugo Lloris the Parisian wearing the number 14 jersey assisted Giroud’s goal just before the one minute applause to honour the Dutch legend. One of the best players on the pitch, produced several charging runs ,and finished the game by scoring the winner.